[Dr. Green] firmly believes that if you change someone’s smile through general or cosmetic dentistry procedures, you can change his or her entire life. 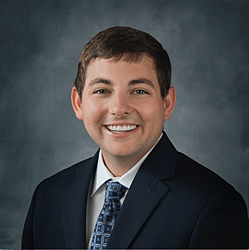 Dr. Austin Green is the newest team member to join Drs. Donna Miller and Michelle Hinds at their leading Creekwood Dental Arts practice. A Waco, TX dentist now, he is originally from the Dallas/Fort Worth area and has always been drawn to the medical field. He firmly believes that if you change someone’s smile through general or cosmetic dentistry procedures, you can change his or her entire life. Dr. Green belongs to a variety of organizations, including the American Dental Association, Texas Dental Association and Central Texas Dental Society. He graduated from Baylor University with a Bachelor of Science, then received his Doctor of Dental Surgery degree from University of Texas School of Dentistry at Houston. He completed his general practice residency at Yale New Haven Hospital in Connecticut. During residency, Dr. Green gained training in complex surgical procedures including implant placement and third molar (wisdom teeth) extractions. The team at Creekwood Dental Arts is very excited to have Dr. Green join them at their leading-edge practice. When he’s not busy improving patient smiles, Dr. Green enjoys traveling, golfing and cheering for the Baylor Bears. Patients in search of a skilled and compassionate dentist in Waco, TX, are encouraged to meet with the newest member of the Creekwood Dental Arts team. Creekwood Dental Arts is a general dental practice offering a variety of preventive, diagnostic and surgical treatment options to patients. Among others, their services include gum disease treatment, cosmetic dentistry, dental implants and general and family services. Gum disease therapy options include laser dentistry that is both gentle and proven effective at targeting infected tissue without hurting healthy tissue. Cosmetic procedures are primarily intended to improve the way the smile looks, although many also improve the function of the teeth and self-esteem of the patient. Popular cosmetic procedures include teeth whitening, dental veneer placement and dental bonding. General and family dental services include regular cleanings, dental fillings and root canal therapy. Individuals interested in improving their smiles through general or cosmetic dentistry are encouraged to meet with a skilled dentist in Waco, TX. To schedule an appointment with Drs. Miller, Hinds or Green, patients are invited to call Creekwood Dental Arts at 254-870-9026. Creekwood Dental Arts is a general dental practice offering personalized dental care to patients in Waco, TX. Drs. Donna G. Miller, Michelle Hinds and Austin R. Green provide an array of services with state-of-the-art technology. Dr. Miller was honored to receive The Mastership Award from the Academy of General Dentistry, the highest and most respected award in general dentistry. To learn more about Drs. Miller, Hinds and Green or the services they offer, please visit their website at CreekwoodDentalArts.com or call 254-870-9026 to schedule an appointment.